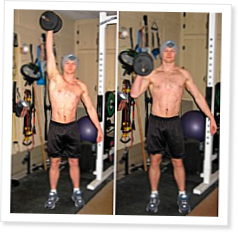 When assessing the most functional of upper body movements, it is tough to argue against the efficacy of vertical pressing movements (a.k.a. overhead pressing). Those individuals who labor for a living routinely take items and place (press) them over the head onto something else. If you work around your home you’re often placed in a position of extending the arms above the head to retrieve or replace a needed item. If you participate in outdoor activities, the roof of the car often may carry equipment such as a bike, canoe, or kayak. Therefore, I officially rank vertical pressing as my number one choice for upper-body strengthening movements. Dumbbells are the perfect tool for vertical pressing for a number of reasons. They are well suited to the anatomy of the shoulder, allowing the glenohumeral joint to follow a natural path as the weight is pressed. First off let me say that I find your articles on dumbbell training absolutely phenomenal. As a Level 1 CF'er, I try to incorporate the most effective and efficient movements into my workouts as well as for my clients. That said, how do you compare DB training with Kettlebells? I recently attended a KB cert and what I learned and put into practice has made me stronger in so many different ways. I am a 50 year old Marine and feel fitter now than when I was 30, and I use KB's almost exclusively for my presses, snatches, swings, etc. After reading your articles, I have gained a much better perspective on using the DB. I guess we CAN have the best of both worlds! Anyway, please keep up the great work. Look forward to hearing from you.